Larco provide superior fire rated personnel doors for all types of premises including both industrial and commercial units. 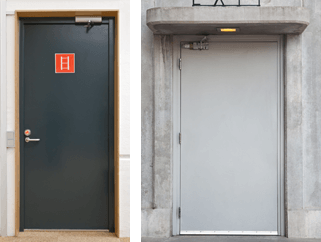 Providing superior protection in the event of a fire in all types of public and commercial building, our exit doors (steel personnel doors) are up to 4 hour fire rated, offering ideal security for both personnel access, heavy duty use and fire Rated Escape exit. Larco Engineering provide Fire Rated door-set options in single or double leaf and each of these industrial door units are all made to measure.